That's OK. I probably wouldn't have known either if it hadn't been advertised that he would be at the airshow. 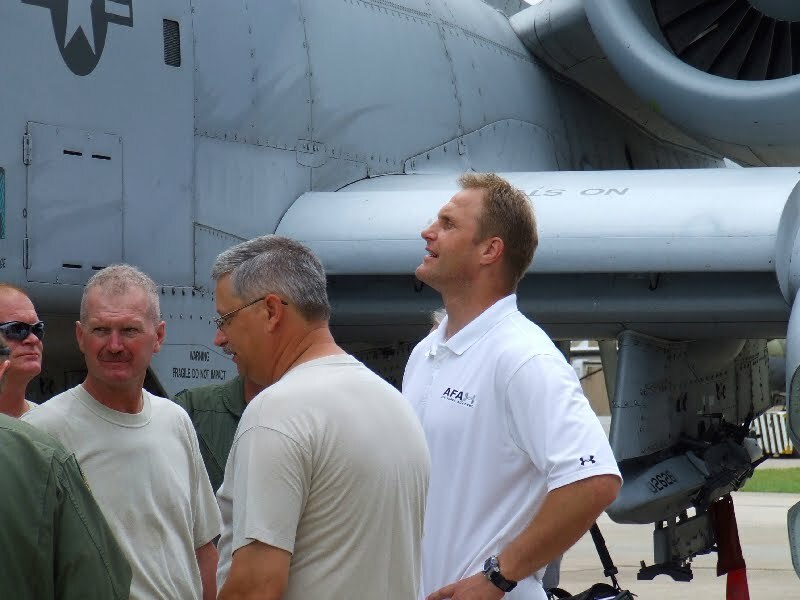 This man is Mr. Chad Hennings, former A-10 Warthog pilot and Dallas Cowboy defensive lineman. He was a graduate of the Air Force Academy and was drafted into the NFL in 1988. He delayed his entry to fulfill his obligation to the Air Force. After he was done, he joined the Cowboys as a 27 year old rookie and went on to play for nine seasons. He was there to give a talk about his flying days and about the Warthog later in the evening. We didn't stay for that but did stay long enough to see some of the old warbirds take-off and circle around the flight museum. Way cool! I just saw your Airshow tag in the sidebar today, aren't those Warthogs LOUD? And people complain when the Hornets are flying here, just wait til a batch of those A-10s flies in for training!